Silkworms are picky eaters: They like only one type of food: leaves from the white mulberry tree. 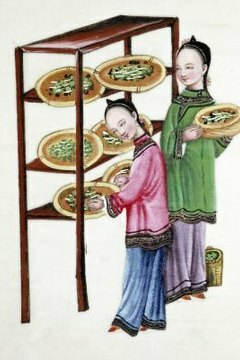 Humans engaged in sericulture -- the keeping of silkworms for the purpose of harvesting silk from the insects' cocoons -- feed silkworms their preference for the highest-quality silk. It is not necessary to provide silkworms with water. The silkworm's appetite for the white mulberry tree leaf is so voracious that arborists and botanists often refer to the tree as the silkworm mulberry. Its leaves are the silkworms' top choice for food; usually it's the only choice silkworms readily accept. Leaves that are just fully developed but still young and tender are best for feeding silkworms, according to the United States Department of Agriculture. That dining preference is a good thing for silkworms: White mulberry trees have short life spans but grow much faster than other trees, thus quickly producing matured leaves. When white mulberry leaves aren't available, silkworms will eat the leaves of the osage-orange tree as well as other mulberry tree species. It's more like a necessary evil than a preferred choice: The quality of the silk produced via worms eating these leaves is generally not as high as that produced via silkworms eating white mulberry. The discussion of silkworms' preferred food is, in reality, moot. This is because silkworms no longer live in natural or wild settings where they can make their own dietary choices. Humans provide their food and keep them in production-oriented settings. According to the online magazine Informed Farmer, silkworms were domesticated in China nearly 5,000 years ago. Silkworms have become extinct outside of silk factories and the hobby boxes that children sometimes keep them in, according to the Burke's Backyard website. An artificial diet comprising primarily mulberry leaves is available at most pet or feed stores. Silkworms eat, and they eat some more. As larvae, silkworms never stop eating, according to the Burke's Backyard website. It was their insatiable appetite for white mulberry tree leaves that inadvertently created the demand for the silk produced by their cocoons. According to a legend posted at Burke's Backyard, silk was discovered when Chinese Emperor Huangdi ordered his wife Xilingshi to find out what was damaging his mulberry tree. She discovered white worms eating the leaves and spinning shiny cocoons. In an experimental move, Xilingshi dropped a cocoon into hot water in a tea cup to see if the worm would die. The pupa inside the cocoon did perish, but in the process, a slender thread of silk unwound itself from the cocoon and started an industry the Chinese kept secret for centuries. It is best to acquire fresh mulberry leaves to feed silkworms. Give them as much as they will consume. If you are buying artificial food, the Silkworm Shop recommends 2 pounds of silkworm food to raise 50 silkworms from egg to cocoon. The Guardian: Silkworms: An Environmentally Friendly Delicacy? Does Silk Really Come from Spiders? Is a Giant Panda a Herbivore? What Will a Bess Beetle Eat?